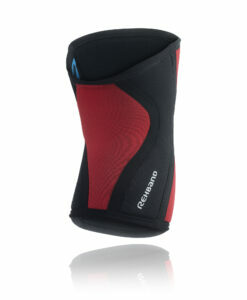 The world’s most trusted knee support from Rehband. 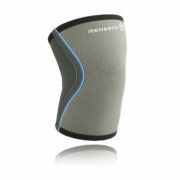 Whatever your athletic endeavor from Strongman to Crossfit, these patented knee sleeves have you covered. IWF and IPF approved for competition! Move Better: The patented 3-D anatomic construction of the Rehband knee support enables higher muscle coordination, increased joint stability, and reduced energy waste. 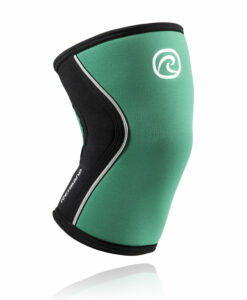 The compression provided by our sleeve increases blood flow and receptive input from the knee, helping to improve muscle memory of how to move correctly. 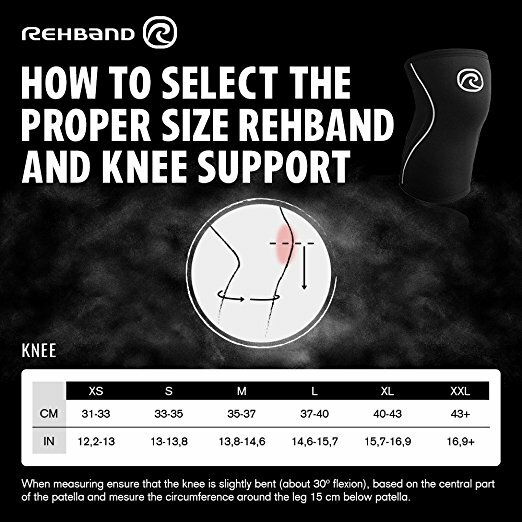 When using a Rehband knee sleeve, you can actually perform movements better – in terms of balance, coordination and muscle activation – because you’ll have increased awareness of your knee position and degree of flexion. Feel Stronger and Safer: The knee is one of the most vulnerable areas of the body, and requires extra support during heavy or long workouts, or following an injury. 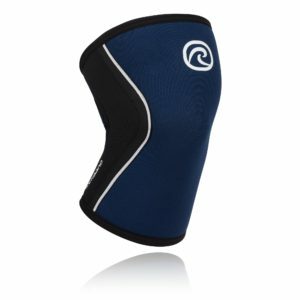 The Rehband knee support combines the key benefits of stability, compression and warmth to give you a mental and physical feeling of safety and strength.Combined with better movement, you can feel a higher level of confidence in any activity. 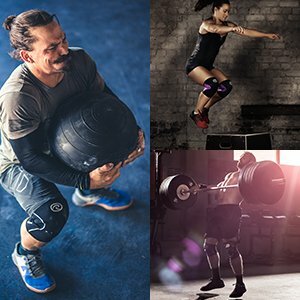 Improve Performance: Not only will a feeling of safety and strength help you push yourself further, but the compression provided by the Rehband knee support enables you to perform more controlled and stable movements. Maneuver with assurance and confidence, in the right plane of motion. Together with the warmth that protects your joints and soft tissues from injury, compression will increase your performance capability. Get ready to set new personal bests in your training! 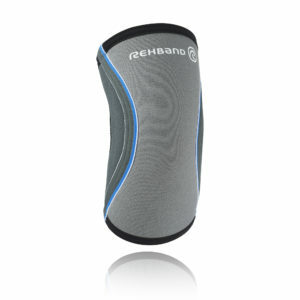 Speed Up Recovery from Injury or Strain: Rehband knee sleeves are not only designed to protect your knees when you are injured, but also to prevent injuries and re-injuries. The faster you get back to exercising after an injury, the faster the recovery process will be – Rehband knee sleeves help you regain control of the knee, and get back to being active sooner. 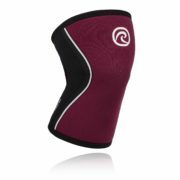 Also, the warming effect of the Rehband knee sleeve helps increase blood flow more quickly, and keeps the knee warm throughout an activity. Maintain Stability, with Both Comfort and Confidence: Our 5mm neoprene knee support hugs your knee, providing warmth and stability without sliding down your leg. 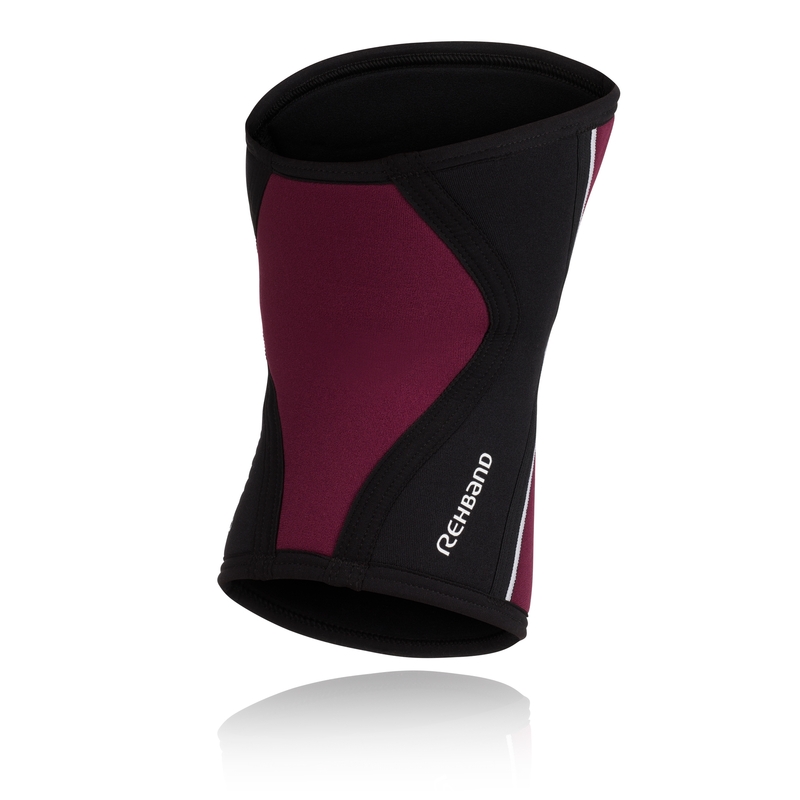 Smooth, integrated seams ensure comfort throughout any movement, without chafing. When you wear a Rehband knee sleeve, the knee reaches an ideal operating temperature faster, so the joint is well prepared when you start exercising. 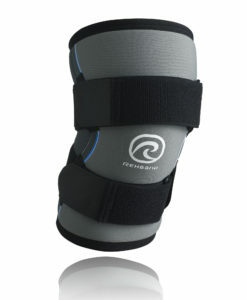 It’s a knee support that will quickly feel like a natural part of your body! Aligned with Body Mechanics: The patented anatomical fit and shape of the Rehband knee support allows it to follow the body’s motions, ensuring that it stays in place during workouts. This creates a combined mental and physical frame to keep your body moving towards strength instead of injury. 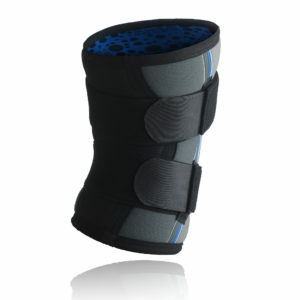 It also helps ensure that you perform movements in a more controlled and safe manner. 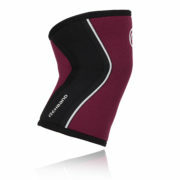 The knee support will guide your body in correct movement, without limiting muscle development around your knee. 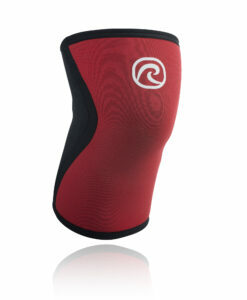 Uniform Contoured Compression: If you look inside a Rehband knee sleeve, you can see the actual contour of a leg, not just an angled tube. 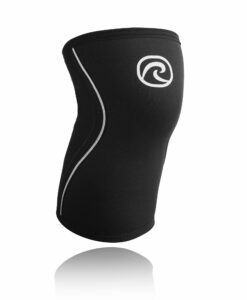 This anatomical shape makes the compression much more even throughout the whole knee, giving it much greater efficacy and function in supporting proper movement and comfort. 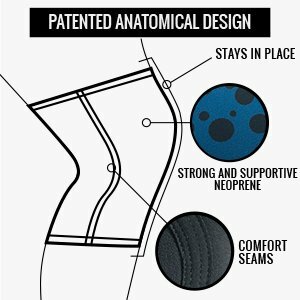 Combining Sports and Medicine: The Rehband knee support is classified as a medical device, and is built on Rehband’s long medical history. At our R&D center in Sweden, each of our products are researched and developed in close cooperation with health professionals and elite athletes. The Rehband team includes specialists and textile engineers. Based in Scientific Research and Evidence: When developing knee sleeves, we look at the scientific evidence and research available. In all product development, we go through risk analysis, toxicity testing, and physical trials to validate the high performance we expect. 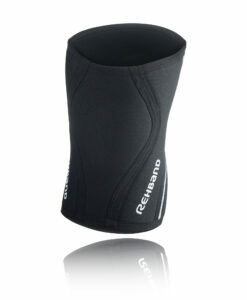 Highest Quality Material: Rehband knee sleeves are constructed with neoprene, a long-lasting material with different degrees of rigidity that enable our knee sleeves to be both elastic and stable. All Rehband knee sleeves and materials are tested both in the lab and in close cooperation with athletes, to ensure that they deliver the effects they promise. 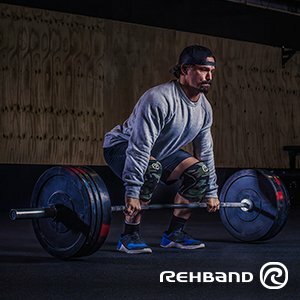 All Activities: Rehband knee sleeves can be used by all athletes, practicing any sport at any level, to improve performance and to prevent injuries. 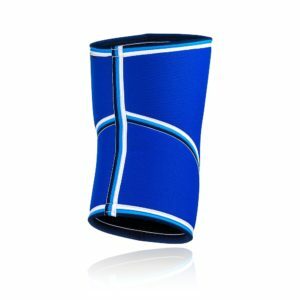 The 5mm knee sleeve in particular is designed to be used for all sports and activities by delivering consistent support with a unique level of flexibility and agility. 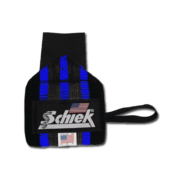 This allows any type of athlete – from runners and hikers to gymnasts and martial artists to elite powerlifting competitors – to venture through any training regimen without discomfort or restriction in movement. 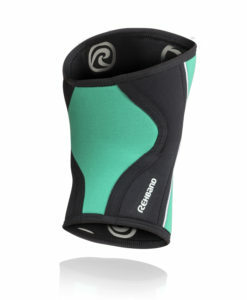 All Ages: Rehband knee sleeves can help young athletes who need extra joint support while they’re still growing, senior athletes who don’t want to be slowed down by prior knee injuries or strains, and anyone in between. 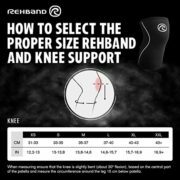 All Skill Levels: The Rehband knee support is focused more on taking care of your body and preventing injuries than it is on any specific activity or level of experience. Anyone can suffer a knee injury, whether they’re a beginner or elite athlete. Rehband reduces the strain on knees during any training, and helps you regain knee control, especially when you start to get tired and balance and coordination get worse. Strengthening AND Healing: The Rehband knee support promotes blood flow to reduce inflammation and enhance recovery, whether you’re seeking to reduce knee impact during intense activity or recovering from knee pain or a knee injury. By correctly guiding your body’s movements, our knee sleeve also increases your work capacity and protects joints and soft tissues from injuries while training. 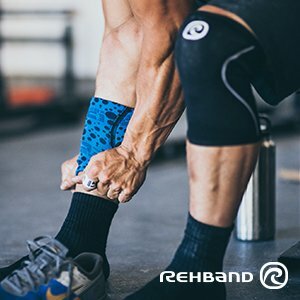 Wear it Anywhere, Anytime: You can wear the Rehband knee support for as long as you need, in any context – even just walking around the neighborhood. Anatomic construction and smooth integrated seams ensure comfort, and the longer you use our knee sleeve, the better and more controlled your knee movements become. Choose the Best! Take the Best Possible Care of Your Knees – and Your Health! 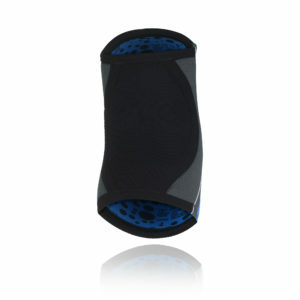 Feel safe, confident, and secure in any activity! Move better and get stronger! 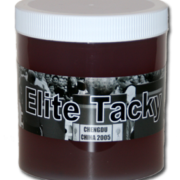 Tap into the quality and reputation that is trusted by elite athletes worldwide! Wherever you push your limits, and wherever you strive for greatness, Rehband will be there supporting you to enable your full potential, today and tomorrow. We own and control our entire production chain – no outsourcing! With Rehband, you never have to be in doubt. Our patented products are preceded by extensive research and you can expect the highest quality, function and design from everything we make. Enable your full potential, today and tomorrow! We know what you don’t settle for anything but the best when it comes to your choices in life! We share your high standards and expectations for quality! Choose Rehband to improve your journey to better fitness, strength, and health right now!